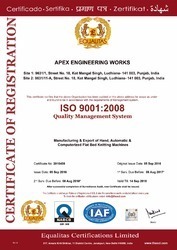 Apex Engineering Works was established in the year 1997. It is located at Ludhiana, Punjab. 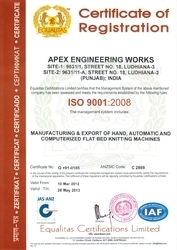 We are one of the most prominent manufacturers, suppliers and exporters of Hand Knitting Machines to our clients. Our range of machines includes Flat Knitting Machines, Knitting Machines, Linking Machines, Cone Winders, Electronic Computer Display. These machines are manufactured in our advanced manufacturing unit that is spread across a sprawling area and under the guidance of our expert professionals. They are available in various specifications and can be customized as per the demands of the clients. We procure raw materials from our trusted vendors in the market. Under the inspiring guidance of our mentor Mr. Kuldeep Singh Nanhray, we captured market for our products in the market. By the ability to understand the requirements of the clients and his industrial experience made us successful in the market. We are supported by a state of art manufacturing unit. This unit is equipped with sophisticated machinery and according to latest technologies. In order to carry out our production process efficiently and in an organized manner, we are backed by our highly advanced and dedicated team of professionals which helps in keeping us ahead of our opponents.